Stylish bronze picture light with a subtle minimalist outline that will stunningly enhance - yet not detract from - your artwork of choice. The distinctive bronze finish houses two G4 lamps, ideally positioned to showcase your artwork to its best advantage. The slim design gives the light the flexibility to be used effectively in a number of different settings and is dimmable to provide exactly the amount of light required. 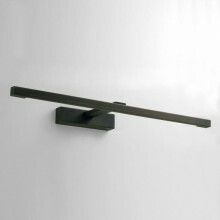 This very contemporary design would fit well in most types of rooms and includes an integral transformer.